Flowers that repeat bloom throughout the season are often the most coveted by gardeners. But these plants don’t come without a price and often that price is vigilant deadheading. Although deadheading isn't difficult, it is, time consuming. The resulting long season of bloom may be well worth it, but you need to balance your garden with a few plants that don’t need any deadheading at all. The plants listed here only bloom once, so there’s no reason to deadhead. They bloom only once, but they remain attractive all season with flowers that dry right on the plant or maybe even interesting seed heads. 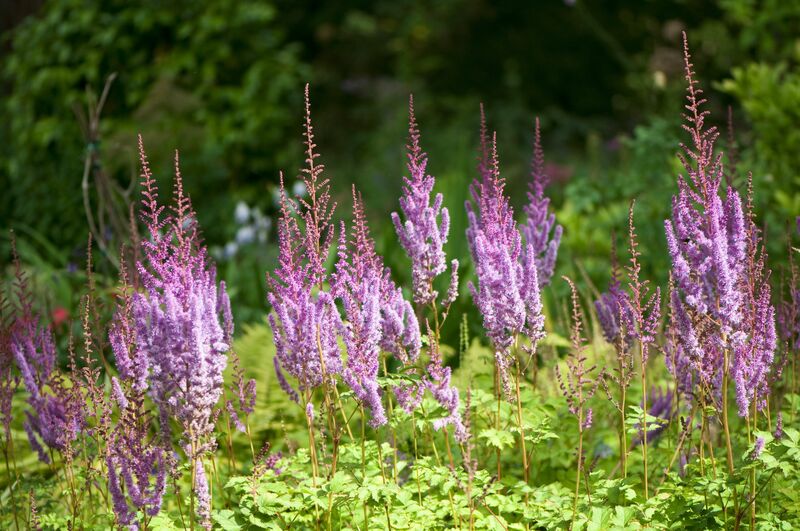 Astilbe hardly need flowers to make them desirable plants. Their lacy foliage and carefree growing habit make them garden classics. The flower plumes start shooting up weeks before the flowers actually open and remain attractive weeks afterward. You can cut them back, if you prefer, or you can just leave them there until they die back on their own. USDA Zones 4 - 8. Barrenwort is dainty and slow growing, but it grows where few other plants are happy - dry shade. Newer varieties come with colorful variegated leaves, for longer interest. The foliage remains attractive long after the flowers are history. It’s the leaves that give Epimedium its common name “Fairy Wings”. But the dainty flowers, in a multitude of colors, are most welcome in mid-spring and they deadhead themselves. They’ll tolerate full sun to full shade and even the dry shade under trees. USDA Zones 5 - 9. You’ll recognize the leaves of acanthus in Greek art and architecture. Bear’s Breeches are often referred to as architectural plants because of their height and classic connotations, but the purple and white flowers certainly hold their own against the foliage. They’re sun loving and drought tolerant. They are also quite prickly, so be careful if there are small children around. USDA Zones5 - 11. Cimicifuga makes a great garden focal point. It can shoot up well over 4 ft. tall and then send up an even taller plume of feathery white that lasts most of the summer. Cimicifuga can take a few years to get established and you may need to pamper it with water those first few years, but it’s no prima dona. Once it makes the adjustment to your garden, it requires very little attention. USDA Zones 4 - 8. Baptisia is a North American wildflower, so you can expect it to be low maintenance. It now comes in yellow and bi-colors, but it’s the original violet-blue flowers that make the most striking effect in the garden. Baptisia is in the pea family and you’ll see the resemblance right away in the shape of the leaves. If you leave the flowers to go to seed, they’ll turn into pea-like pods that will dry on the plants and rattle in the breeze. As with Blue Star (Amsonia), Baptisia plants can have a tendency to split open in the middle after flowering. Shearing them back will make them sturdier plants, but you’ll miss the rattles. It’s easier to simply plant them in the middle of other plants that will support them. USDA Zones 2 - 9. There must be something about plants that send up flower plumes that makes them so low maintenance. Goat’s beard has flowers that are very similar to astilbe, but much larger. Plants can easily reach 5 ft. tall. Goat’s Beard is a sun lover, but it does quite well in partial shade and the flash of white certainly brightens things up and stays in bloom from early to mid-summer. USDA Zones3 - 7. Joe Pye Weed used to truly be a weed. You can still see it growing wild along roadsides. But its cultivated cousins are much better behaved and even more stunning. ‘Gateway’ was the first to breakthrough in popularity. It’s a shorter variety, but there are many on the market now to choose from. The mauve mop head flowers appear in early fall and carry on through the season, so there’s no need to deadhead them. Use the tall varieties as a backdrop for your garden borders throughout the summer. USDA Zones 4 - 8. Not all Ligularia have spotted leaves like the photo at left, but most are grown for their foliage. The leaf shape is unique and other varieties have dark, purple foliage. But the tall yellow flowers are what give it the nickname “The Rocket”. Unfortunately Ligularia needs a lot of moisture. It even makes a great bog plant. If you can make it happy, it will spread far and wide, but not to the point of being invasive. Trust me, there will always be some other gardener who’ll be happy to take your extras. USDA Zones 5 - 8. Peony blooms are far to brief, but well worth it just the same. When they burst open in late spring, the fragrance carries throughout the neighborhood. Seed pods will follow and unless they weigh down the plant, there’s no need to remove them. The deeply lobed leaves will remain attractive for the rest of the season and makes a wonderful backdrop in the garden. USDA Zones 3 - 8. The soft gray leaves of Russian Sage make a beautiful statement against pastels and purples of every hue. The brilliant blue flowers seem to sneak up on you, starting as a faint tint, moving through brilliance and fading back to a soft blue. By the time they’ve fully faded, the season is over and you’ve had months to enjoy your Russian Sage. USDA Zones 5 - 9. One of the most attractive and adaptable of the irises. Siberian Iris have the typical iris leaf blades, but unlike many of their cousins, Siberian Iris leaves don't flop or scorch after blooming. The plants remain a contrasting form in the garden long after the blooms have faded. They can spread quickly in moist conditions and require division when they get crowded. In warmer zones they may re-bloom in the fall. USDA Zones4 - 9. Brunnera has delicate sprays of blue flowers in the spring, even before its leaves fill out. Newer varieties have wonderful variegated foliage. ‘Jack Frost’ is particularly attractive and widely available. Brunnera eventually self-deadheads, but you can trim it back along with some of the earlier leaves, as summer heats up. New leaves will fill in even fuller. USDA Zones 3 - 9. Tall Sedum are easily one of the most self-sufficient plants for any garden. If they could defend themselves against deer, they’d be perfect. Sedum are late bloomers, but while they’re waiting for their moment, they have thick glossy leaves and fill out in nice, chubby clumps. The flowers start out green, like a head of broccoli, and eventually finish off in shades of mauve. USDA Zones3 - 10.